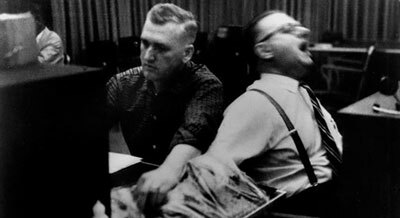 In 1965 Milgram boosted his burgeoning notoriety with the release of ‘Obedience’, a movie documentary of a repeat of the classic study. Below is an edited compilation of clips from the movie – copyright © 1991 Alexandra Milgram. According to such commentators as Hugh Coolican (1996), most people who see the movie are convinced that the behaviour of the participants in ‘Obedience’ is authentic and that the stress caused by their moral strain is real. However, ‘Obedience’ may not be quite what it appears to be, according to Kathryn Millard (2011). In fact, the raw footage for ‘Obedience’ was shot over a weekend in May 1962, using what Milgram called ‘Condition 25’, a slight variation on the classic study. He used the same actors to play ‘Mr Wallace’ and ‘Jack Williams’ as always and the participants were genuinely naive. The camera filmed through the same 2-way mirror Milgram used to observe proceedings. As Diana Baumrind stated only too clearly in 1964, there are serious ethical issues with Milgram’s experiments. She expressed concern that such behaviours – especially deception – could damage trust in psychologists and their research. The first ethical dilemma with Milgram’s experiment is deception. The researcher deceived the participants, who were made to believe that they were truly inflicting pain on the learners and were purposely put in a position of high stress. According to James Nairne (2011), some teachers even believed they had badly hurt, or even killed the learner, causing them a lot of distress. Milgram also lied about the purpose of the experiment. While it was truly to measure obedience, he told his participants that he was studying the effects of punishment on learning. This meant the participants couldn’t give fully-informed consent. Although the participants were debriefed after the experiment was over, Nairne asserts many critics believe that it wasn’t enough because it didn’t prevent the subsequent psychological damage that could have affected the participants. Then there is the question of harm. Clearly the moral strain most participants experienced caused them considerable stress – psychological harm. According to Blass (p115), though, Milgram claimed that “relatively few subjects experienced greater tension than a nail-biting patron at a good Hitchcock thriller”. William Menold said, “It was hell in there… . [I was] hysterically laughing, but it was not funny laughter…It was so bizarre. And I mean, I completely lost it, my reasoning power”. He said that he couldn’t believe “that somebody could get [him] to do that stuff”. Herbert Winer, said that his experience of the experiment was “very difficult to describe…the way [his] feelings changed [about it], and the conflict and tension that arose”, and that his “own heart condition went into an extremely tense and conflicted state”. Talking about the debrief at the end of the study, Winer said he “was angry at having been deceived… resented the whole situation [and] was a little embarrassed at not having stopped earlier”. Responding to the post-experiment questionnaire a year after the classic study, 84% said they were either glad or very glad to have taken part, 15% were neither glad nor sorry to have taken part and 1.3% were either sorry or very sorry to have taken part. 74% stated that they had learned something of personal importance. The questionnaire seems to justify Milgram’s argument about tension and stress. Of course, when physiological harm is considered, in the classic study, 3 men had full-blown seizures! In terms of the ethical guidelines to come, Milgram breached the participants’ privacy by watching them through a 2-way mirror and filming one set of volunteers;. Their right to withdraw was not denied outright but it was undermined by Jack Williams’ verbal prods. Milgram did respect the participants’ confidentiality. None was ever named unless they came forward themselves. In the ‘Obedience’ movie, the 14 volunteers who resisted the researcher’s pressure are well-represented; but only one man out of the 26 who went to 450v is shown. Presumably the other 25 refused to give their permission to be included. Clearly Milgram also respected their right to have their data withdrawn. As for debrief, Milgram effectively created the modern debrief. After the 1963 publication such was the professional outrage at what Milgram had put his participants through – though he suggested it was the results people found unacceptable more than the methodology – that his membership of the American Psychological Association (APA) was suspended. Later, however, the APA gave Milgram a major award for his obedience experiments! In 1974 Milgram published details of a whole series of variations on the original 1962 ‘Obedience Experiment’. He wanted to investigate reasons for the high levels of obedience – how much the concept of agency could be validated and how much moral strain participants could take. So, in a systematic way, he changed one variable at a time to see what the effect was. Apart from that one change, Milgram replicated the original experiment precisely. In all, Milgram studied over 1,000 participants. Milgram also considered whether the location of the experiments had any bearing on the authority of the experimenter. He moved the experiment to some run-down offices in nearby industrial Bridgeport, ostensibly run by a private firm, Research Associates of Bridgeport, and had the researcher not wearing the scientist’s lab coat but a warehouseman’s overall. In that condition he found that only 47.5% would go to the full 450v. Background was also investigated. Participants who had gone on to higher education were less obedient overall – possibly because they had learned to think independently and may also have gone on to higher positions in life where they were used to giving orders, rather than receiving them. Correspondingly, participants with a military background, used to receiving orders, tended to be more obedient. Roman Catholics tended to be the most obedient from amongst those who were members of Christian churches. To counter the accusations of gender bias with regard to the classic study, Milgram replicated those conditions with 40 local women and found that gender made no difference – 65% went all the way! A small number of participants in one of the experiments were rated on Lawrence Kohlberg’s Stages of Moral Development – 34 according to Milgram and 27 according to Kohlberg (1984). While the number of defiant participants (8) was small – too small to be anything other than ‘suggestive’ (Milgram) – they undoubtedly scored higher on Kohlberg’s scale – at a Post-Conventional level, indicating the ORANGE and/or GREEN vMEMES were dominating their selfplexes. Accordingly, the more obedient could be deemed to be at a Conventional level and concerned just with obeying the legitimate authority, indicating BLUE was dominant. In response to dispositionalists such as Theodore Adorno (Adorno et al, 1950) – who argued that authoritarian personalities will obey much more than personalities low in authoritarianism, one of Milgram’s assistants, Alan Elms (Alan Elms & Stanley Milgram, 1966) tested sub-samples of the 20 most obedient and the 20 most defiant from Milgram’s first 4 experiments, using Adorno’s F-Scale (Fascism Scale) questionnaire, designed to identify authoritarian personalities. He found that those who tested highest on the F-Scale gave more stronger shocks and held the shock buttons down longer than those who were low scorers. Though Elms’ sample groups are small, the implication is that there is indeed a dispositional element in blind obedience – so that some will respond to a situation demanding obedience more than others. Not all the replications were as faithful to Milgram as they could have been. One of the more concerning was that of Mitri Shanab & Khawla Yahya (1977). Working with 6-16 year-olds, they found 73% of the children gave what they believed were real electric shocks to other same gender peers. A further potential confounding variable was that the researcher was female. One of the more interesting replications with regard to gender differences was that of Wesley Kilham & Leon Mann in Australia in 1974. They found 40% of males would go to 450v but only 16% of females. However, potential confounding variables were that participants were all first-year Psychology students and the females’ victim was female student. The lower obedience rates overall may be attributed to the notion that in Australian culture there is more of a tradition of questioning authority. Possibly the most important neo-replication in terms of supporting Milgram’s Agentic Shift Theory is that of Don Mixon (1972). Participants were recruited through prior general consent – to avoid outright deception – with the result they knew vaguely the area of research they were being involved in but not the specific hypothesis. They were then asked to role play naive participants in a set-up similar to Milgram’s. Those that were told the researcher was responsible for any distress to the learner behaved much like Milgram’s participants – ie: as agents. Those that thought they were personally responsible were significantly less obedient – showing much autonomy. The 21st Century so far has seen 2 worthy attempts to replicate Milgram. 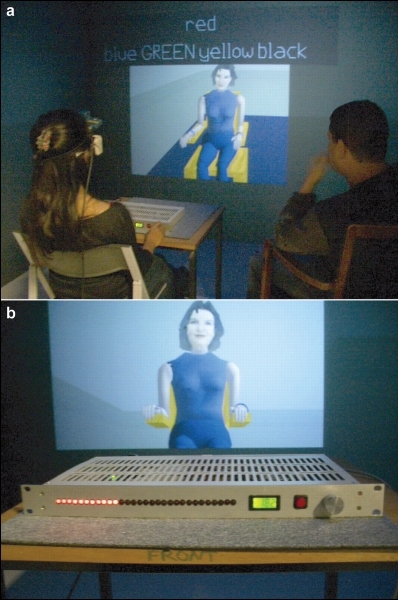 In 2006 Mel Slater et al aimed to find out whether people in a Milgram-type situation would respond to destructive orders in virtual reality. 34 volunteers were recruited from staff and students at University College, London, to play ‘teacher’, interacting with a ‘learner’ avatar. 23 teachers had full visual experience of the virtual reality while 11 communicated with the avatar by text. The experimenter ordered the teacher to give a series of 20 ascending shocks when the avatar got an answer wrong. The avatar exhibited responded with increasing discomfort and protests to being shocked, eventually demanding termination of the experiment. In spire of this, 73.9% gave the full ascending range of shocks to the virtual reality learner. The participants had their arousal levels measured through galvanic skin resistance and heart rate. Skin conductivity, heart rate and interview responses all indicated the participants suffered moral strain and stress as a result of hurting the avatar. In 2009 Jerry Burger became the first experimenter in over 30 years to get permission to carry out a Milgram replication. However, Burger had to make major concessions to get the go-ahead. All the volunteers were pre-screened by clinical psychologists, with those with any signs of emotional or psychological disorder being screened out. The researcher was also (secretly) a clinical psychologist briefed to stop the procedure if a teacher showed signs of excessive stress. Also all trials of those continuing to obey the experimenter were stopped at 150v. It was reasoned that, if the participant would give someone 150v, the likelihood was that they would give them 450v. 22 women and 18 men took part in the replication. Participants were told 3 times that they could withdraw from the study. Only a 15v shock was administered to the teacher, as opposed to the the 45v in Milgram’s studies. 65% of the males and 73% females were willing to go beyond 150v. A further 30 participants were tested with a confederate acting as an additional teacher. The additional teacher expressed unhappiness about administering shocks to the learner and eventually refused to go on. This was a slight variation on one of Milgram’s own variations but the results were quite different. Whereas this significantly reduced obedience in the original, 63% of Burger’s participants carried on after the confederate refused. Burger’s participants were ethnically diverse with 54.3% (white), 18.6% (Asian), 12.9% (Latin/Hispanic), 8.6% (Indian- Asian) and 4.3% (African -American). Overall the level of education was higher than in Milgram’s classic study group, with 22.9% having tried college at some point, 40% having bachelor’s degrees and 20% having master’s degrees. Participants were paid $50 and told that the money was their’s to keep, even if they quit the experiment early. One of the most interesting replications in terms of gender differences was carried out by Charles Sheridan & Richard King (1972). They theorised that perhaps Milgram’s participants had merely played along with the experiment because they realized the victim was faking his cries of pain. Accordingly, they decided to use real electric shocks. Obviously they couldn’t use a human for this purpose, so they used the next best thing: a cute, fluffy puppy. Students, acting as the ‘trainer’, were required to train the puppy on a discrimination task by punishment with increasingly severe and real shocks. The participants could see the dog suffering and hear its yelps and howls. The researcher did not assure the participants that the puppy would suffer no harm. Many participants tried to gently coax the puppy to escape the shock, to no avail; others shifted nervously from foot to foot, as if sympathising with the animal whose paws were trapped on the electric grid. Some hyperventilated, gasping for air, or even began to cry. As in Milgram’s experiments, however, those who protested were sternly reminded that they had no choice and must continue with the regimen of punishment. Having been informed at the outset that this was an ‘important’ scientific investigation into the “critical fusion frequency” in canine vision, almost all suppressed their own better instincts and ultimately surrendered to authority. Eventually the puppy received an odourless anaesthetic gas to put it to sleep, leading participants to think they’d killed it. 54% of the male participants went to the maximum voltage – but, interestingly,all of the female went to the max! Some carried on obeying orders to zap the dog after it had ‘died’. Not a scientific piece of research but relevant nonetheless is Le Jeu de la Mort (The Game of Death) is a French/Swiss television documentary broadcast by the French public television channel France 2. It was presented as a social commentary on the effects of obeying orders and humiliation in reality television, and its broadcast was followed by a studio discussion on the programme. The documentary focused on a modern version of the Milgram experiment, with the additional factor of reality television’s popularity and influence on the general public. The experiment was performed in the guise of a game show known as La Zone Xtrême. Volunteers were given €40 to take part as contestants in a “pilot” for the fictitious show, where they had to administer increasingly stronger electric shocks to trained actors posing as players as punishment for incorrect answers, as encouraged to do so by the host and audience. Only 16 of 80 contestants chose to end the game before delivering the highest voltage punishment. Although by this time Abraham Maslow had been published several times with regard to the Hierarchy of Needs and Clare W Graves had published his model, Milgram clearly didn’t take into account different complexities in thinking influencing when and how someone might be obedient – and to what degree. Indeed so trapped does he appear to have been into his 2-dimensional situationalist view that, it was only with great reluctance he accepted Elms’ findings that ‘personality’ can exert a dispositionalist influence on obedience. Nonetheless, for all the flaws in Milgram’s work, his obedience experiments are not only brilliant in concept but they do reveal a distinctly concerning tendency to obey, especially under situational pressures.